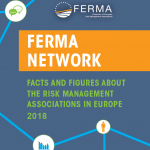 FERMA’s 2016 European Risk and Insurance Report (ERIR) is gathering the views of more than 600 European risk managers at a time of major changes in Europe. The findings of this report, combined with FERMA’s mission and strategy, will shape our activities over the next two years. One of the priorities that our members see for FERMA is to strengthen the professional standing of risk managers in Europe, and FERMA’s professional certification programme rimap® will be an important contribution to achieving that objective. FERMA’s 2016 European Risk and Insurance Report is a source of valuable information and topics for further discussion to build the profession.